Sending Group SMS or Web SMS enables you to advertise or promote a product or a service. BulkSMS.Com.PK offers free SMS software that helps in SMS marketing and SMS advertising. BulkSMS.Com.PK provides various group SMS services. One of the most efficient services is sending messages online to a group at one instance. The only thing you will be required to do is to create and manage the group SMS address book. You can include friends, family, clients and employees into various groups and thus send the messages to the respective groups when needed. 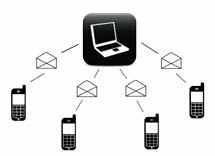 A single message can be sent to a single group or multiple groups simultaneously. There is no limit to the number of people you can send the message to. Sending group SMS is the most efficient, cost effective form of communication. You can send them at any time, from anywhere. By using BulkSMS.Com.PK you can send SMS from online phonebook, excel sheet, bulk SMS HTTP Gateway, websites or SMS software.